Steel Cranes' unusual approach and airy, open arrangements makes Tango an interesting listen every time through. Steel Cranes have patience and power and a big, angry sound. Their second album, Tango, finds the guitar and drums duo usually sounding like a quartet, thanks to some well-arranged bass guitar and accent instruments like cello or organ. But Tracy Shapiro and Amanda Schulke leave a lot of open space in their arrangements, which give their heavy music a uniquely airy quality because they aren’t filling every moment with chugging rhythm guitar chords. “Ebb” kicks off the record in a haze of heavily distorted guitar that fades in and out over Shapiro’s vocals. The hazy guitar continues even when the acoustic guitar is replaced by a simple drumbeat and carefully measured bassline. “Ebb” is a slow, nuanced song that is anchored by Shapiro’s aching vocal performance and that ever-present guitar. The chorus, which is simply Shapiro singing “I have changed / I have changed / I have so little to say”, is striking in its starkness. Turns out that “Ebb” is par for the course on Tango, which is filled with striking, unhurried songs that display intense emotions. Shapiro gets maximum impact from her distortion pedal, which she repeatedly deploys to unusual effect. At times she shreds like the lead guitarist of a metal band. “Pretty” departs from its quiet verses mid-song for an extended, ripping solo that’s initially backed up by nothing more than drummer Schukle’s cymbal rolls. Eventually the beat and the bass return to provide more traditional support for Shapiro’s solo, but the sparse arrangement sets Steel Cranes apart. “Happy” is one of the few songs that uses the distorted guitar in an overly familiar manner. The verses find a wall of guitar sound reminiscent of ‘90s shoegaze bands (except that there’s just the one guitar; if they'd really wanted the shoegaze wall, they would’ve triple-tracked it) blazing away. But the chorus opts for a martial snare drum beat and harsh organ sound to provide a big contrast to the distorted guitar. The bluesy “Her” finds Schukle’s simple 6/8 beat and bluesy bass playing giving the band a slightly different sound. Shapiro is still pissed off, singing about a two-timing boyfriend whom she believes wants her but who also refuses to leave his previous woman. There’s a solid rhythm guitar part, too, which really adds to the backwoods blues feel of the song. “Sandglass” is characterized by its quietly arpeggiating guitar, but the use of a cello, mostly lodged firmly in the song’s background, enhances the song’s melancholy tone. The one moment of lightness on Tango comes at the opening of “Take Me Down”, which features a jangly major key guitar riff for 20 seconds, complete with a “Yee-haw! !” Then it instantly shifts into a slow, tom-heavy dirge, complete with an oppressive, swirling distorted guitar riff, creepy bassline, and foreboding cello. This builds into the album’s one full-on heavy metal moment, where Shapiro’s distorted solo is backed by pounding drums and and yes, a rhythm guitar chugging along on chords. And then it returns to the dirge to finish out the song. 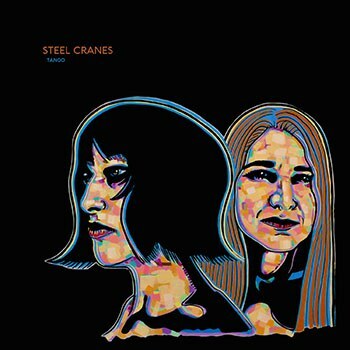 Steel Cranes' unusual approach makes their songs particularly striking. It also helps that they don’t quite do the same thing twice at any point here. That means their songs are distinct even in the few cases where they aren’t particularly great. It makes Tango an interesting album to listen to every time and encourages listeners to find new musical details they might have missed the previous time, and that makes it one of the year’s most compelling albums.